3 Ingredient Energy Bites. I am a fan of all things no bake. You probably already guessed that from the large amount of no bake recipes in my recipe index. I am also a big fan of 3 ingredient recipes. Homemade snacks do not have to be hard or time consuming. In fact, these healthy vegan energy bites take only minutes to make! You are probably wondering what is in these 3 Ingredient Energy Bites right? 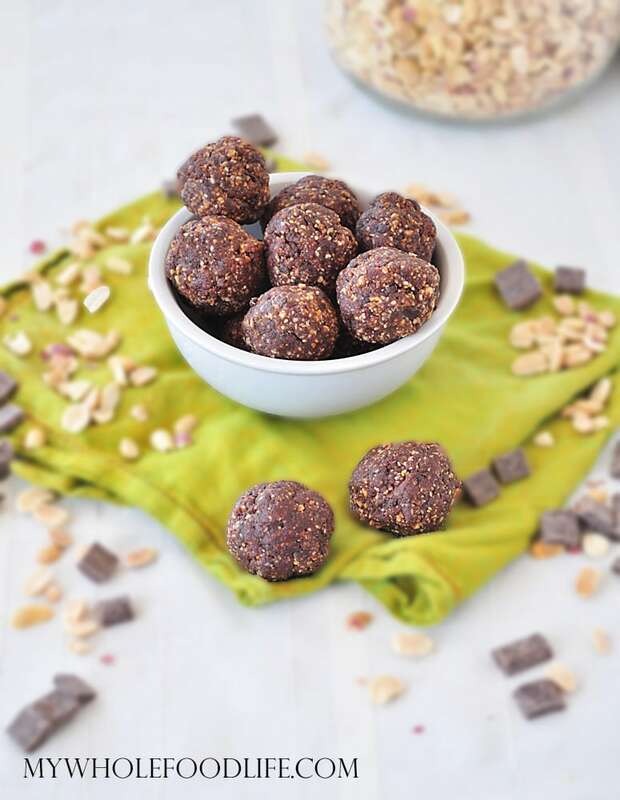 This healthy vegan energy bites are very adaptable to add in whatever other flavors you may like. These little bites of goodness are vegan, gluten free and grain free. If you need a nut free version, you can always use sunflower seeds instead of peanuts. These would also work with almonds. Need more energy bite recipes? A super easy snack idea! In a food processor , combine all the ingredients except for the water. Slowly, 1 tablespoon at a time, add the water and pulse until the dough starts to get sticky. The dough will look a little loose, but I promise it firms up nicely in the fridge. These bites should last a couple weeks in the fridge. You can also freeze them. Looks yummy. Would you recomended using hazelnuts? Thank you! Hazelnuts would be yummy in these. Chop them up first though. Thanks Grisha! Yes it will be available on Jan 13th at Barns and Noble. Happy New Year! can i use peanut butter instead of peanuts? You might be able to, but the other ingredients may need to be adjusted. Any idea what the calorie count is for these? I made them last night and they are delicious! I'm sorry, I don't. I bet you can plug the recipe into My Fitness Pal for an estimate though. Glad you liked them! Do you have to use coconut? I'm not a huge fan, and I was wondering if I could substitute it for something else. Thanks! You can probably omit it or use something else. Maybe flax meal? I have a silly question...Do you roll them into balls prior to putting the dough into the refrigerator or put it into the refrigerator and roll into balls after the dough firms up? I am looking for something like this to take on a trip with me that does not require refrigeration. Would these be ok? I am allergic to oats and wheat, among other things so it's not so easy to find bars that work. These should be fine as long as they don't get too warm and melt the chocolate. These look great! Am wondering, has anyone subbed cocoa powder for the choco chips? Looking to get it as low carb pad possiblev. Maybe add a tablespoon of maple syrup? That would be roughly 33g net carb per batch?